Year 4/5 children from across the five schools within the First Federation attended a day at Exeter Cathedral. Throughout the day, the children took part in activities such as brass rubbing, mosaic making, clay work and prayer writing. They also had opportunity to listen to stories about the darker side of the cathedral told by Mr Clive Fairweather and to take part in guided tours of the cathedral. Between 12.00 and 12.30 the cathedral was closed to the general public and the children from all of the federated schools took part in a special service led by Reverend Paul Wimsett. A beautiful solo (Ava Maria) was sung by Miss Collis, a former teaching student at Chudleigh Knighton Primary. Prayers and Bible readings were read by pupils from the five schools and the service ended with a blessing by Father Danield from Salcombe. 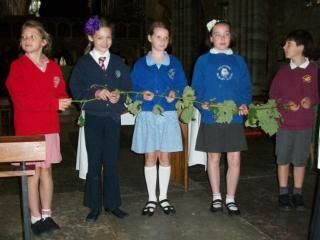 At 2.00pm a short prayer service was held in the cathedral and prayers written by the children were read out.